This is a custom built pistol by gunsmith Colin Bell based in Rotorua, New Zealand. The pistol is based on the proven design of the 2011 Wide Body Pistols avaialble in three Calibers, 9mm, 38 super & 45ACP. The pistol is mainly built using Solid Billet Parts manufactured by GUN & BELL CUSTOM PRECISION PARTS (GBC), all which carry a LIFE TIME WARRANTY and the parts we don't manufacturer ourselves we used the best possible items available, like KKM Precision Barrels & Wolff Springs, Phoenix Trinity Grips and CK Arms Frames. 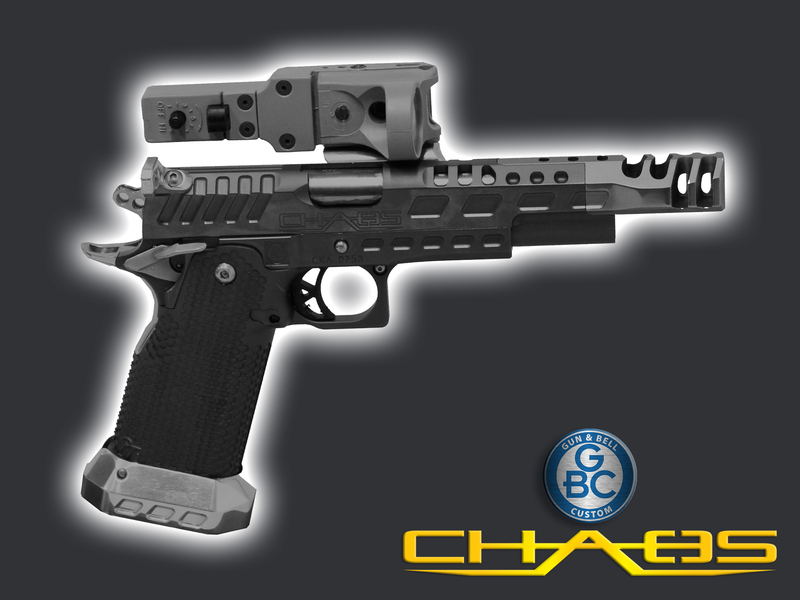 The new generation GBC 2011 CHAOS M9-11 Open Division Pistol has been re-designed with a number of new features not seen on IPSC Open Division Pistols before, built and intended for IPSC Matches, designed for long service life, accuracy & reliability with high stability and steadiness when shooting quick & fast. New designed GBC Slide Racker that stays fitted to the slide when removing the slide from the frame and the "Slide Racker" will not come loose or break like many others out there do. Newly designed GBC 90 Degree Low Profile Optic Mount, this mount is light but strong, actually lighter than the conventional Mount, this mount gets the dot as low as physically possible above the slide of the pistol. A completely re-designed Compensator that has an Expansion Chamber fitted with six gas ports 4 of which is twin double sided. Also has four Progressive Hybrid holes ...... boy, do these pistols shoot flat! "ALL NEW" Thumb Rest design, replaces the standard slide lock catch/release, this new thumb rest solves the problem where a thumb rest mounted on the Optic Mount is often to far forward to be effective. The new GBC Thumb Rest comes in 2 different angles, 20 or 30 Degrees. Slide will not lock open with thumb rest fitted. We now use Phoenix Trinity 2011 Stainless EVO Aggressive Textured, Stainless Aggressive Textured, Stainless Classic Smooth Textured, or Aluminium Classic Aggressive or Smooth Grips. The new GBC magwell with its Large Mouth Design & High Sided Edges with Aggressive Texture, not only helps with fast and efficient mag changes, but helps to push the hand higher on the grip for a lower overall gun height and added with the texture on the side of the magwell helps the hand grip firmly for perfect pistol control. Many an hour has been spent on the slide design, removing metal from places that will not effect the integrity of the slide itself, but help enhanced the efficiency of the slide operation and still look smart. No metal has been removed around or near the ejection port to avoid cracking as seen on many an Open Class Pistol. Pistols are finished to the colour of your choice, using Cerakate base colours that are available at the time. The Chaos Pistol range is not normally a stock item, they are built to order only. If you are interested in purchasing a CHAOS M9-11 (9mm), M38-11 (38 Super), or a M45-11 (45ACP) pistol, please contact us and we will send you a specification form to complete, we can then quote you for the best pistol you will ever own. Magazine's not included in price, sold as extras.